Since the repeal of the Fixed Book Price Agreement in 1995, the fate of the independent bookseller was seemingly sealed. 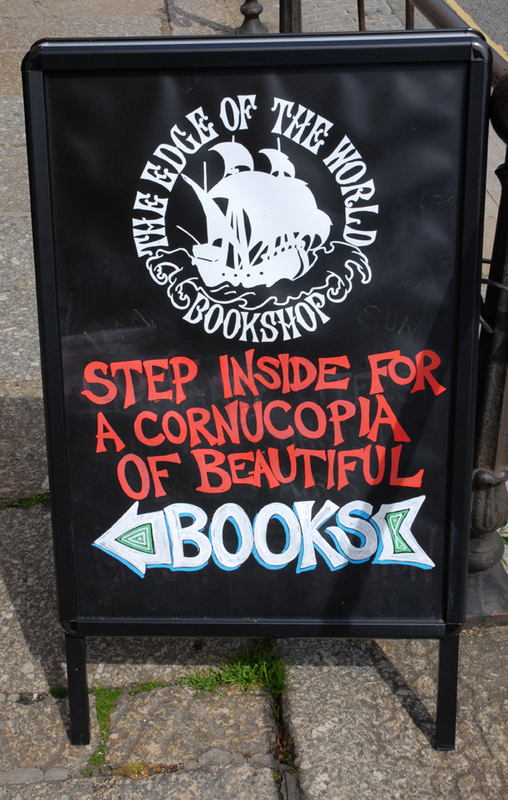 But why, then, did James and Rachael Howorth go out on a limb to open The Edge of the World Bookshop in Penzance? How could they hope to take on the mighty Amazon and the high-street giant WHSmith, a branch of which stands across the street as if to challenge them? Is it because, like art, literature is loved in our county? The romantic scenery and the history mixed with legend make a fitting backdrop for reading and writing alike, and Cornwall is certainly a haven for authors of both prose and poem. The numerous annual literary events must surely confirm the local love affair with books. Partly thanks to this regional characteristic, Books Plus on Market Jew Street had been run successfully by David and Barbara Mainwaring, but after 20 years of hard work building a loyal and loving customer base, their career finally ran its natural course and the shop went on the market earlier this year. With an art background, James Howorth has had a varied career, which latterly led him to work at the Tate Modern bookshop, and then to manage a secondhand and antique bookshop in the West Midlands. His wife Rachael had been a researcher for BBC Radio 4. Not uncommonly, it was the allure of the laid-back, seaside lifestyle that led them to look for a change of location, but it was their mutual passion for books that found them browsing Google for vacant bookshop premises. Just one option came up: Books Plus. They viewed it, and within weeks they were moving to Cornwall with children, Leila and Finna, in tow. We spoke to James about their decision and ambitions. James is inspired by the bookselling culture in France and Germany where shops are regarded as special places, where the book selection is curated by passionate owners, where knowledgeable staff enthuse and guide, and where the environment is carefully designed to enhance the experience. 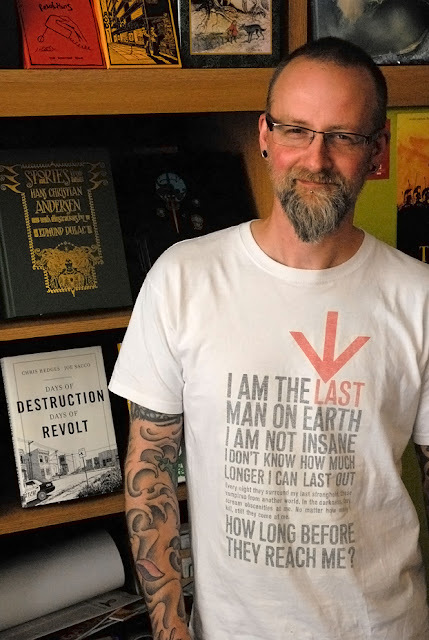 As well as all this, James' personal vision features a more open, interactive experience; rather than a shrine, his dream bookshop is alive with literary happenings for all ages. And these have already begun with book signings and readings in the shop, and by taking a pop-up version of the shop to outside events. People love bookshops because they're inspiring places, and James knows this is his most powerful weapon against the Goliath-like web retailers. He explains: "The population of Penzance really embrace independent shops – we have customers who search for books online and then buy them from us, just because they want to keep an independent bookseller in town – and I can't ask for more than that". James's opinion of our independent shopping scene is insightful: he says, "Shop owners have taken a leap of faith to open in a place like this, and in this economic climate, and they're really go-getting because of that – they've really got to pull out all the stops – which might lead towards everything that is in Penzance being of a higher standard". One of the joys of a bookshop is stumbling upon an obscure title that you could never otherwise find. So part of the trick is to hold onto the character of a true indie bookshop, while still offering breadth for a wide audience. The shop stocks bestsellers next to short-run books on niche topics, and literary greats next to self-published local authors – and there's a particularly good children's section. James has his own prized books, of course, and he proudly shows us a collection of exquisitely bound and illustrated classics. Their vision to create a more engaging experience led them to change the name of shop. "We wanted a name that sounded like a book title, something that had a romantic charm and would capture the imagination of children too". 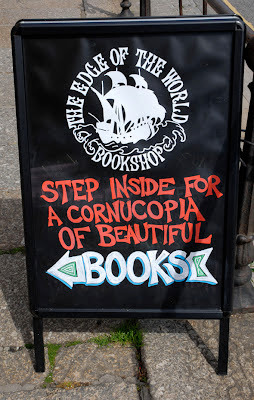 The Edge of the World Bookshop is also their own tribute to the location and their perception that West Cornwall is a separate, magical place, a world apart from the rest of the country. Along with the new name comes an eye-catching fascia and, to follow, a fresh interior fit-out, new window fittings and an old-style swinging shop sign. Plans on the distant horizon include conversion of the cavernous meat cellar (the shop was once a butchers) into an events space or reading room. Loyalty is another key to being a local retailer, and past Books Plus fans will be glad to know that the loyalty card scheme is still in good working order. The couple's genuine love for the area, enthusiasm and determination to create a good thing for Penzance has endeared them to the local community, and they've been overwhelmed by support and encouragement. 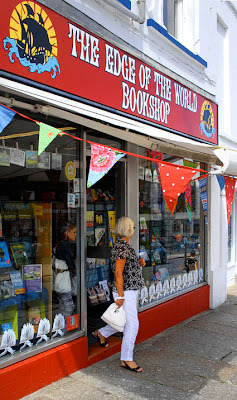 They've even been given helpful advice from competitors, like Ron Johns who runs the Falmouth and St Ives Bookseller. All this points to a promising future for the shop and we wish them well. So, if wet weather drives you off the beach and you're heading for the shelter of the town, here's one fine place to spend a happy time indulging or reigniting your love of books.